Jan Joseph van Goyen (1596-1656) was a Dutch landscape painter. Van Goyen was an extremely prolific artist; approximately twelve hundred paintings and more than one thousand drawings by him are known. 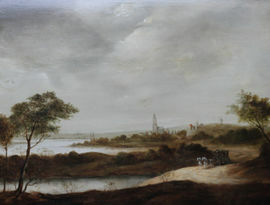 Jan van Goyen was the son of a shoemaker and started as an apprentice in Leiden, the town of his birth. Like many Dutch painters of his time, Jan van Goyen studied art in the town of Haarlem with Esaias van de Velde. At age 35, he established a permanent studio at Den Haag (The Hague). Though he seems to have kept a workshop, his only registered pupils were Nicolaes van Berchem, Jan Steen, and Adriaen van der Kabel.The list of painters he influenced is much longer. In 1652 and 1654 he was forced to sell his collection of paintings and graphic art, and he subsequently moved to a smaller house. He died in 1656 in The Hague. According to the art historian H.U. Beck, "In his freely composed seascapes of the 1650s he reached the apex of his creative work, producing paintings of striking perfection".